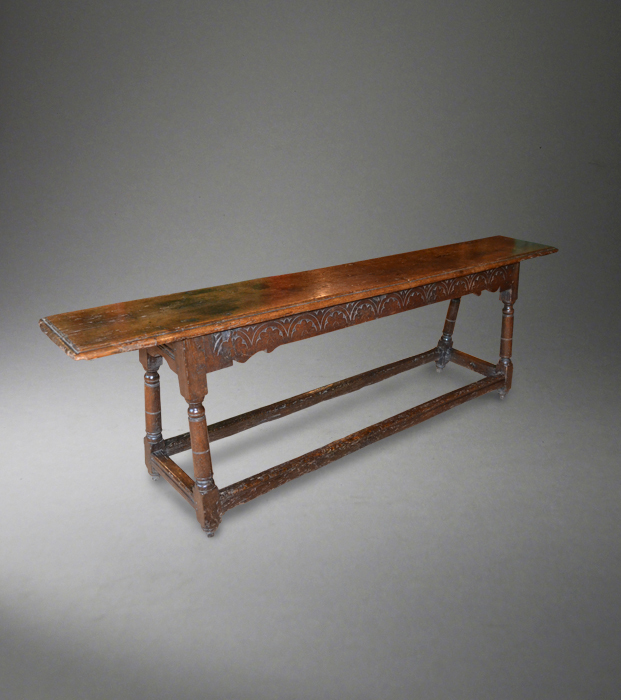 Suffolk House Antiques | A mid 17th century oak form or bench. A MID 17TH CENTURY OAK FORM OR BENCH. Recently acquired from a fine collection of early furniture in Wiltshire, this typical oak form has a good overhang to the top and the rails are carved with lunette design and incorporate spsndrels carved from the solid. Gun barrel turned legs terminating on their original toes and peripheral stretchers. Good untouched colour and condition. the top is 65 1/2 inches long x 10 1/2 inches deep and is 20 1/2 inches high. The price is £3450. See lot 114 at Bonhams recent sale of the Morville Hall collection for a similar form which fetched £9375.